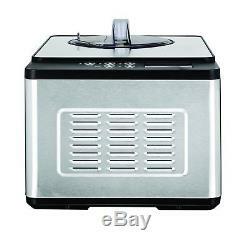 Whynter ICM-200LS Stainless Steel Ice Cream Maker, 2.1-Quart, Silver. Stainless steel housing , Voltage: 110/120V 60Hz , Power: 180 watts. 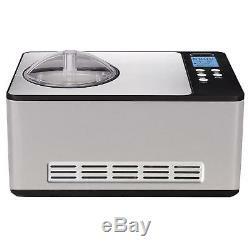 Self-contained frozen dessert maker that does not require pre-freezing. Removable bowl and churn blade for easy storage and effortless cleaning. Choose a well-ventilated area with temperatures above 60°F (16°C) and below 90°F (32°C). Motor Protection Function that shuts off to prevent damage if the mixture freezes solid. Take on dessert making like never before! Make delicious homemade ice cream that you can fully customize to taste with the Whynter ICM-200LS 2.1 Quart Ice Cream Maker. Incredibly easy to use, you can create delicious ice cream, rich creamy gelato and sorbet all in the comfort of your own home. 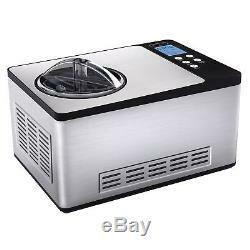 Ideal for entertaining, this high capacity unit makes up to two quarts of your favorite frozen dessert in a single batch. 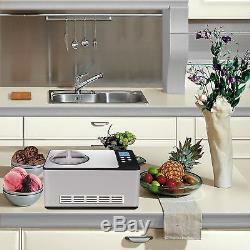 Our full featured ice-cream maker offers premium functions not available in budget ice cream makers. A built-in powerful compressor freezer allows for continuous use without the inconvenience of having to pre-freeze the mixing bowl. Not only is it so much easier, it also tastes a whole lot better. 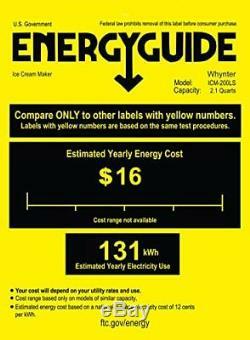 The Whynter ICM-200LS features an Extended Cooling function that prevents the mixture from melting and a Motor Protection function that stops the motor from churning to prevent overheating or damage to the motor when the mixture becomes solid. 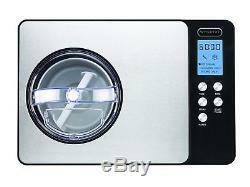 This unit also includes an electronic timer, ice cream scoop and easy-to-follow recipe guide. The sleek stainless steel exterior and soft touch LCD control panel will accent any kitchen counter. This will quickly become your new best friend. You will never again have to wait hours or take up freezer space before being able to make your favorite frozen dessert. This unit includes an electronic timer, temperature display, ice cream scoop and we'll even send you some secret recipes on request! 10.25 x 11.25 x 16.75 inches. Return the item in the original packaging within 30 days. We take your satisfaction very seriously and we will do everything to make sure you have a pleasant experience shopping with us. Give us the chance to find an agreeable solution. Your feedback is very important to us as it reflects the service we want to provide our customers. 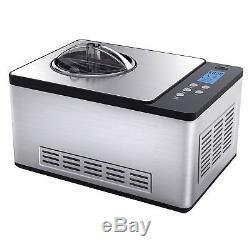 The item "Whynter ICM-200LS Stainless Steel Ice Cream Maker, 2.1-Quart, Silver" is in sale since Monday, June 25, 2018. 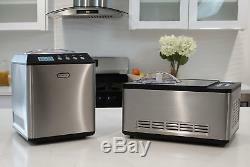 This item is in the category "Home & Garden\Kitchen, Dining & Bar\Small Kitchen Appliances\Ice Cream Makers". The seller is "giraffe_store" and is located in US. This item can be shipped to United States, Canada, United Kingdom, Denmark, Romania, Slovakia, Bulgaria, Czech republic, Finland, Hungary, Latvia, Lithuania, Malta, Estonia, Australia, Greece, Portugal, Cyprus, Slovenia, Japan, China, Sweden, South Korea, Taiwan, South africa, Thailand, Belgium, France, Hong Kong, Ireland, Netherlands, Poland, Spain, Italy, Germany, Austria, Israel, Mexico, New Zealand, Philippines, Singapore, Switzerland, Norway, Saudi arabia, Ukraine, United arab emirates, Qatar, Kuwait, Bahrain, Croatia, Malaysia, Brazil, Chile, Colombia, Panama, Bahamas, Viet nam.